Miss Hall’s School is a leading all-girls preparatory school in Massachusetts. 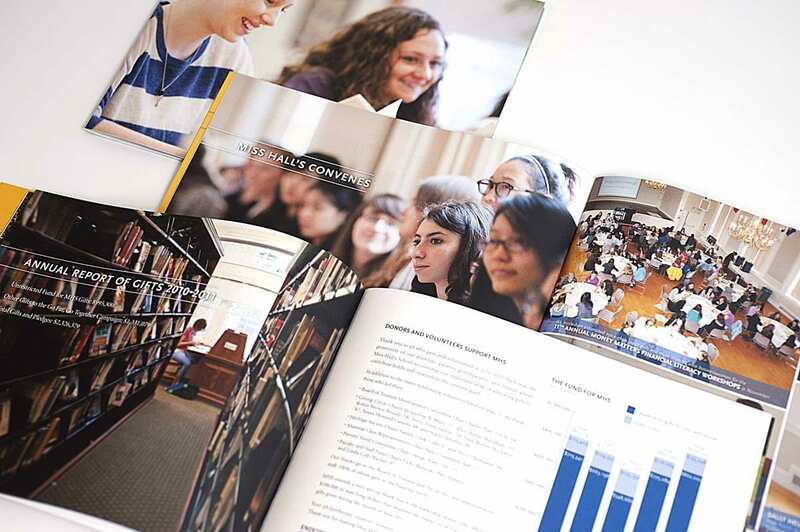 The school approached Studio Two to work on the Annual Report. Creating consensus among the many stakeholders in the school, integrating a variety of media elements and supplied photography, providing clear and clean presentation of dense information, and supervising production and printing on a short timeline were all elements of this project. Working in close communications with the publications staff and the photographer we optimized our files throughout the process, cutting down on prepress and proofing time. Via a carefully monitored version control process and PDF workflow we were able to provide multiple layouts, versions and revisions rapidly and accurately. The project was delivered on-time, on-budget, and to universal approval.